It may look like I was contemplating, but don’t be fooled. I ate that dessert and everything around that dessert! I specifically remember every grown person in my vicinity telling me to cherish my college years—so I did. I loved every darn minute of those years; finals and all! Loving it didn’t mean it was perfect, though. 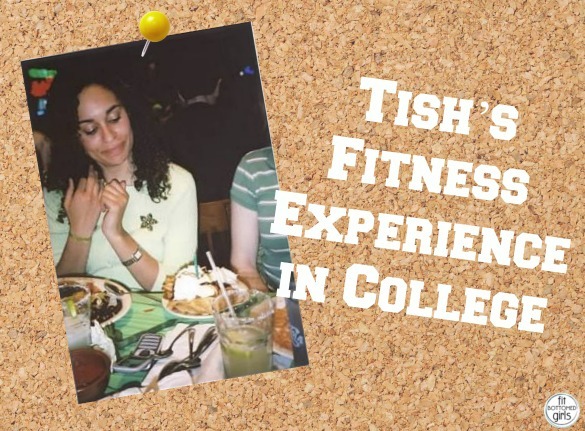 College was definitely full of trying moments, especially when it came to my fitness experiences. The good: I ran track in high school, so I caught the running bug early and, for some reason, the passion followed me to the University of Kansas. I loved my KU running days. There was this perfect high school track near my dorm that I would do lap after lap around. More than anything, I worshiped that alone time. No matter what, I could always clear my head. It was where I went to de-stress, think and process. Remember that ad campaign featured in What Women Want? It was about about a woman and her running? The “No games, just sports,” tag was me to a T.
The bad: I let women in my life bully me into stopping running. Like I said, running was my refuge, but women who didn’t lift anything heavier than a remote control started tearing at my extracurricular activity. They started asking if I had “issues.” They’d tease me in front of people and say I must be anorexic. The teasing hurt and sadly worked its voodoo. I stopped running to prove I didn’t have an eating disorder. To this day, I regret listening to that negativity. They were doing what Jenn loves to refer to as projecting— throwing their issues, insecurities and pains my way. I’ve never been able to get back to that beautiful pace I used to run. Bad and sad, don’t you think? The oh-so honest: I saw the cafeteria and all its buffet glory and went to town my freshman year! I didn’t gain the Freshman 15; I gained 35. We’d go dance until the wee hours of the morning, then make a quick run to Taco Bell and pig out. A couple of burritos, a Gordita, nachos…that was a late-night snack. One time, my roommate and I binged on junk food, four different kinds of chocolate candy and brownies from my favorite restaurant in Lawrence, Yello Sub. By the end of that brilliant night, I was rolling around the floor, groaning. I was young and dumb and unaware that my actions would have some serious visible consequences. It took me a year or two, but I finally came around. I avoided the dorm food like it was the plague, started eating my vegetables and and stopped eating at 2 a.m.